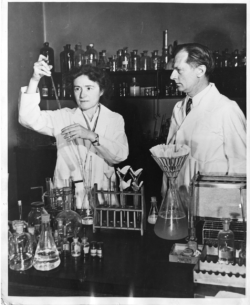 Gerty Theresa Radniz Cori and her husband Carl Ferdinand Cori were given a portion of the divided 1947 Nobel Prize in Physiology or Medicine “for their discovery of the course of the catalytic conversion of glycogen.” Both were born in Prague, in what was then part of the Austria-Hungary. The Coris immigrated to the U.S. in 1922 and became naturalized citizens seven years later. The next year they proposed the glycogen cycle theory that won them the Nobel prize. 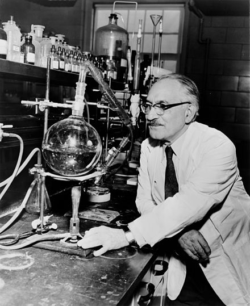 Selman Waksman won the 1952 Nobel Prize in Physiology or Medicine “for his discovery of streptomycin, the first antibiotic effective against tuberculosis.” Born in Ukraine in 1888, he immigrated to the U.S. in 1910. He was a longtime member of the faculty of Rutgers University. 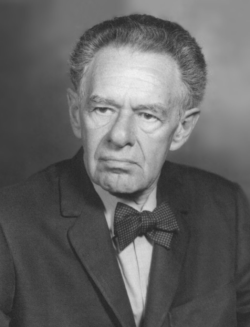 Fritz Albert Lipmann shared a 1953 Nobel Prize “for his discovery of co-enzyme A and its importance for intermediary metabolism.” Lipmann shared the prize with Hans Krebs — Lipmann’s work had clarified an important step in Krebs’ description of the citric acid cycle in metabolism. Lipmann was born to a Jewish family in Konigsberg, Germany and studied there and in Berlin and Munich. He moved the U.S. in 1939. Severo Ochoa shared the 1959 Nobel Prize in Physiology of Medicine for “discoveries concerning signal transduction in the nervous system.” He was born in Spain and moved to the U.S. in the 1940s. André Frédéric Cournand shared a 1956 Nobel Prize for ” discoveries concerning heart catheterization and pathological changes in the circulatory system.” He was born in France and came to the U.S. in 1930, becoming a naturalized citizen in 1941. Georg von Békésy was awarded the 1961 Nobel Prize in Physiology or Medicine “for his discoveries of the physical mechanism of stimulation within the cochlea.” He was born in Budapest, Hungary and moved to the U.S. in 1947. After his lab at Harvard was destroyed by a fire, Békésy became a professor at the University of Hawaii in 1966. Konrad Emil Bloch shared the 1964 Nobel Prize for “discoveries concerning the mechanism and regulation of the cholesterol and fatty acid metabolism.” He was born in Neisse in German Prussia and moved to the U.S. in 1936, fleeing Nazi persecution. 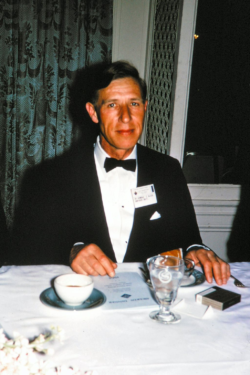 Charles Brenton Huggins was awarded half of the 1966 Nobel Prize for Physiology or Medicine “for his discoveries concerning hormonal treatment of prostatic cancer.” Born in Halifax, Novia Scotia, he studied medicine at Harvard and remained in the U.S. to practice. Max Delbrück shared the 1969 Nobel Prize for “discoveries concerning the replication mechanism and the genetic structure of viruses.” He was born in Berlin and first came to the U.S. in 1932 to research fruit fly genetics at Caltech. Roger Guillemin shared the 1977 Nobel Prize for “discoveries concerning the peptide hormone production of the brain.” Born in Dijon, France, Guillemin was affiliated with the Salk Institute in San Diego, Calif. at the time he won the prize.